These adorable kitty slippers were created by Leslie from Pink Stripey Socks. A great way to give character to an old pair. Materials: a pair of slippers, a glue gun, a bottle of fabric paint, two pairs of scissors (one for cutting paper and one for cutting fabric), a piece of felt, a pen, and a piece of paper. 1. Place your piece of paper on top of your slipper. Carefully trace the curve of your slipper. 2. Using your curve to guide you, sketch out a cat’s face. Cut your face out. Then, trace and cut out two cat faces from your felt. Use your fabric paint to draw your feline’s facial features. 3. Once your paint dries, apply hot glue to the back of a cat face. 4. Line up your felt face with your slipper and attach it. Press down to make sure that your face is securely glued on. Apply more glue if necessary. Repeat the process with the other slipper. That’s it! Now you’ve got a pair of cozy slippers that are the cat’s meow. These cozy slippers made from an old sweater were created by Jen from Drawings Under the Table. Supplies: scissors, pins, yarn, a large darning needle, paper or cardstock, double-sided tape )optional) and an old sweater (try to find something with a tight enough weave that it won’t begin to unravel when you cut it - felted wool works great for this). 1. Trace your foot. Make a rough outline of your foot on a piece of paper or cardstock. Give yourself about 1.5 cm of extra space around the edge for comfy slippers and easy sewing. Cut out your shape, and repeat for the other foot. 2. Place each cutout on the body-area of the sweater, and cut around them to create two sole pieces. It is best if you use double-sided tape to keep the paper from slipping around while you are cutting. 3. Check the boot length. Stick your foot into the sleeve of the sweater through the opening at the wrist. Pull the fabric around your leg to the desired boot length. 4. Snip around your foot. 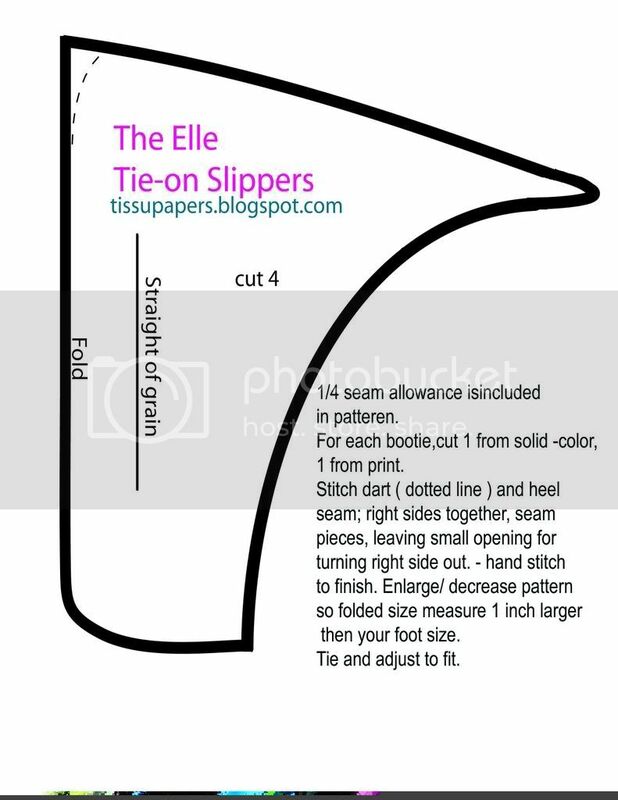 Very carefully, cut the fabric of the sleeve away from the sole of your foot. You are trying to make it so that just the bottom of your foot is exposed. Now you have your leg piece. 5. Connect the sole piece to the leg piece with large pins. Start with one pin at the toe of your bootie, and one pin at the heel. Then stretch the fabric as necessary to line the two pieces up and pin them together. 8. Blanket stitch. With the pins in place, blanket stitch the sole piece and the leg piece together. To do a blanket stitch, (1) push your needle through both layers of fabric from the top (2) pull the yarn through until only a small loop remains (3) bring your needle back down through the loop (4) pull the yarn tight. You can also add a blanket stitch around the opening of your boot to make it look extra polished. This tutorial shows you how to make cute slip-on sweaters out of an old striped sweater, using felt for the sole. With some basic sewing skills, you can make comfy fabric slippers by following these directions. This post shows you how to transform a pair flip flops and a towel into a pair of fuzzy slippers. Embellish a plain pair of slippers with polka dots and a bow, as done here. These directions show you how to create simple slide-ons from a single piece of sturdy felt and a felt button. Turn an old sweatshirt into a pair of scrunchy slippers- get the details here. Use this simple pattern to create cute Dorris Day-inspired tie slippers. Make kimono slippers like these with a few simple pieces of fabric.